15 years serving as the overall PR/Communications firm managing every and all opportunity to fully position the expertise, experience and success of LUCE FORWARD. The ROI of our engagement was calculated monthly and annually by LUCE. For each of the 15 years we exceeded our paid fees by at least 15-20 per cent in value of earned media compared to purchased media. BERKMAN Strategic Communications was the PR/Communications firm of record for LUCE FORWARD Law Firm for over 15 years. Our charge from the beginning was to provide and implement a campaign commemorating their 125 Anniversary in San Diego. They were the 2nd oldest Company, behind the Union Tribune Publishing Company, to formally incorporate and operate their base in San Diego. We developed a strategic plan incorporating a series of print advertisements; commemorative 125th Anniversary Brochure; 15 minute video incorporating its history to present date; 125th Anniversary logo mark; shortened name to LUCE FORWARD; created document of talking points for lawyers about the history of firm; media trained Managing Partner and Executive committee who served as spokespersons at various community meetings and events; supplied recommendations of VIP guests to be incorporated into their guest list; new “Key Messages” for the firm; PR feature story topics for a wide variety of placement with print, electronic, and social media types; researched past members of the firm and interviewed them for quoted comments about their time with the firm; etc. Additionally we provided our expertise and experience in the planning of a major gala celebrating this amazing milestone. The Party was an overwhelming success. The 6 month campaign was a huge success as well, garnering over 250 print and magazine stories; 20 TV stories, 15 radio interviews and over 35 community presentations. Our success with this initial engagement secured our ongoing relationship with the firm. We spent the next 15 years serving as the overall PR/Communications firm managing every and all opportunity to fully position the expertise, experience and success of LUCE FORWARD. We expanded our relationship as they expanded offices. We managed PR for their San Diego, Del Mar, Rancho Santa Fe, Orange County, Los Angeles and San Francisco offices. We worked closely with over 10 practice groups meeting with them monthly to gather story ideas for their San Diego headquarters. Additionally we visited and worked with managing partner and key lawyers of each office on a monthly basis to develop story content and ideas. On over 20 occasions during our relationship, we worked on major crisis situations regarding their clients. We were recommended and brought in by lawyers representing these clients. Our efforts were underwritten by their client for these engagements. 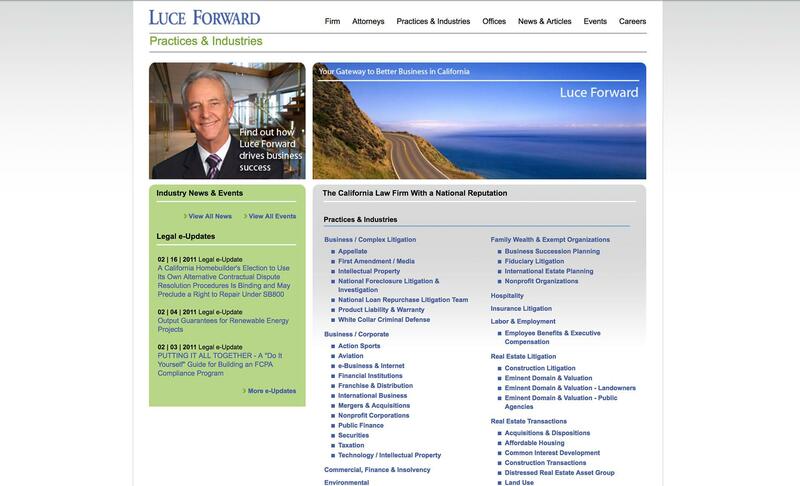 Our relationship with LUCE FORWARD continued through the transition of their merger in 2012. We drafted the merger press materials and media trained our Managing Partner. We worked for the new National law form for 1 year following the merger.